I have written about David Bote some since he began to take off in the summer of 2016 at Myrtle Beach. But today is not about writing down a bunch of words. Rather, it is about appreciation of what it takes to make it. 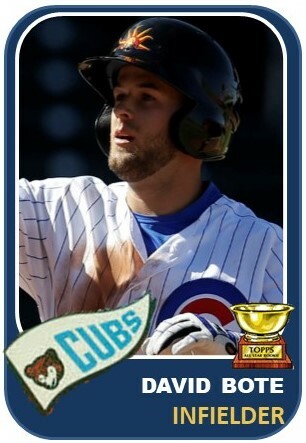 Because every time I see David Bote, I still see the baseball cards I made the past 5 years. They show a young man grinding it out to fulfill his dream. Bote spent 4 summers at some level of A ball before getting to Tennessee in 2017. Let’s take a look back at his incredible journey via some Cubs Central Topp’s recreations. The actual first time I remember seeing him in person was in Clinton, Iowa in the summer of 2014 when he played for Kane County. He was at shortstop that day (but not in these pictures). In 2015, the Cubs moved their low A affiliate to South Bend and Bote was there all year. This is where his transformation into power hitter began. In 2016, he bounced around a bit in the first half before Ian Happ was promoted from Myrtle Beach to Tennessee. In that moment, Bote found a home to ply his craft for the rest of 2016 and he was amazing for the Pelicans. He hit .351 in the second half and lead them to their second straight league title. The hitting continued in 2017, first at Tennessee and then for the Mesa Solar Sox in the AFL. He was put on the 40 man roster late last fall. And then, in 2018, he got off to a great start in spring training with the big league club and again at AAA Iowa.